11x14 Watercolor. 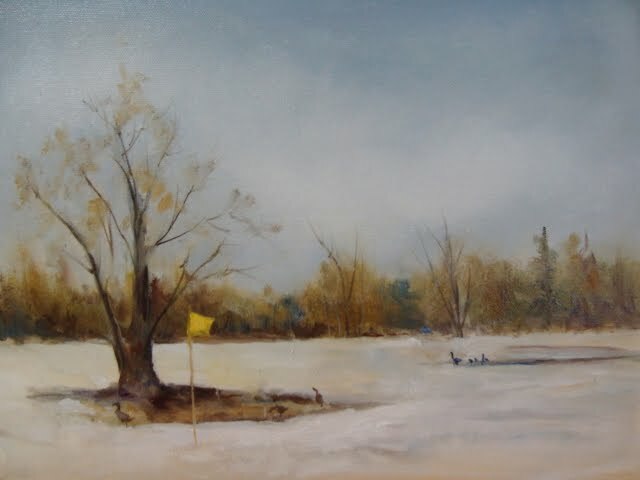 Another painting from a photo taken at the Gull Haven Golf course. Still working on this one. My daughters art teacher in high school would say to the students whose work wasn't up to par "very nice, do over". Well , sorry to say, if this little guy doesn't shape up soon, he will end up in my closet. Yes I will do over. Vic, I am sticking with this, it's becoming a challenge and oh how I love a challenge. 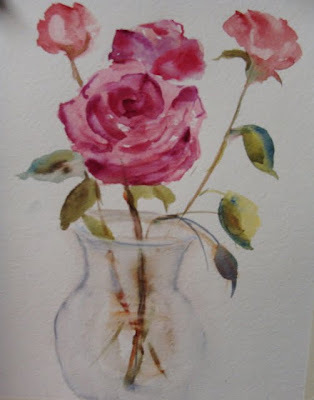 A watercolor study of a Rose. We just got hit with another snow storm, 16inches. 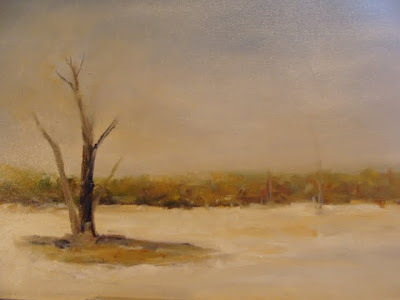 I have been busy working on my oils as well. So what's the saying? How to make lemonade when life hands you lemons. Happy painting everyone. My epiphany for today is To Many Blogs! So I am going to do all of my posting on just this blog. This is just a 20 minute watercolor of a garden path. Desperately needed in the midst of all this snow. Someone please turn off the snow machine. 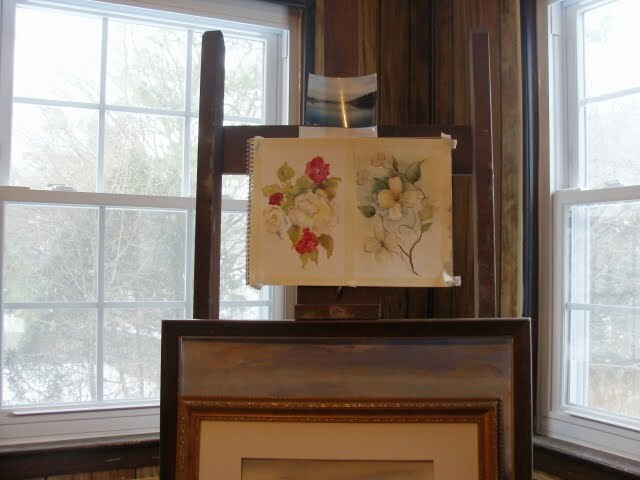 Today, while the snow was falling outside, I started painting flowers. Being an artist is great, we can change the seasons with a stroke of a brush. Happy Painting everyone. I finally got to paint outdoors. 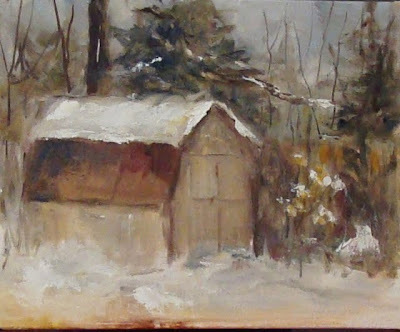 First my pochade box went flying onto the snow, paints, brushes and all. With determination everything was set right and my fun began. It was wonderful being out and seeing the shadows on the snow and feeling the cold. Well that was until my toes went numb. 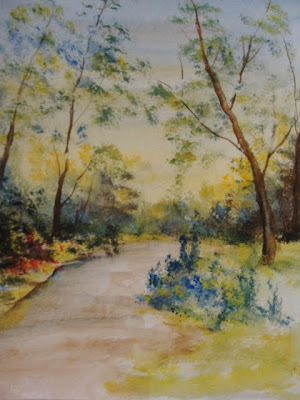 So this was just the beginning of my plein air days. I will finish this painting in the studio. I will venture outdoors again when the temps go up a bit. Happy painting everyone. 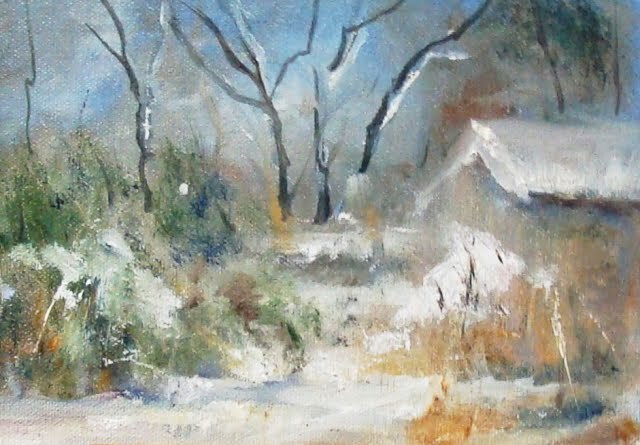 8x10 snow scene from my window. We are getting more snow later today. By the time this winter is over I may really get the hang of painting snow. In the meantime I will continue to make these little studies. Mike and I drove around looking for some interesting snow scenes. I didn't brave the cold weather and paint outdoors. I did however come home with some good digital photos for reference material. Today I began and did this 8x10 oil. It's always such a disappointment when working from a photo. It doesn't have the same excitement as painting outdoors. 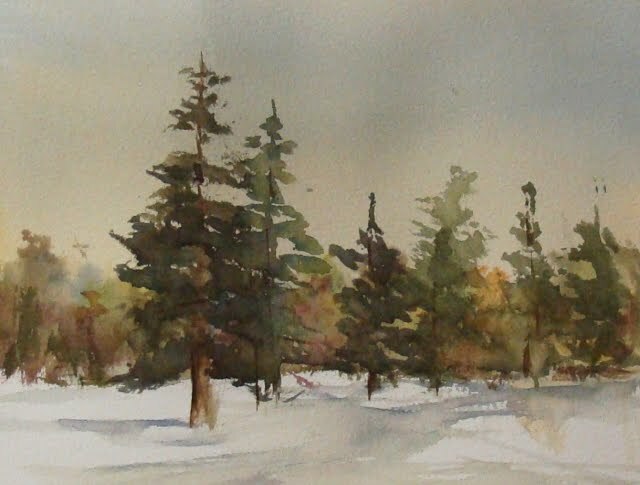 Tomorrow is another day and I will try another snow scene. Or maybe just paint an apple. 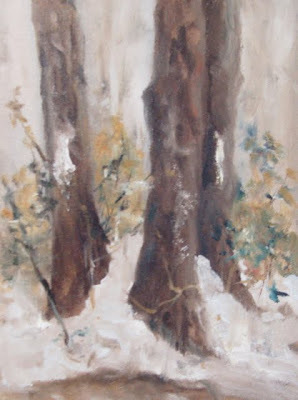 I painted this last year. 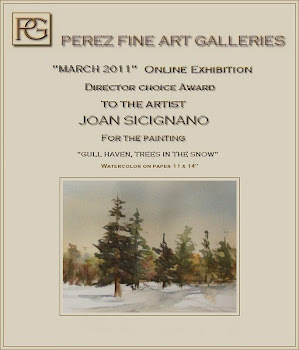 I remember standing in the snow and loved every minute of that experience. I have been waiting for the temps to get a little warmer before I venture out again. 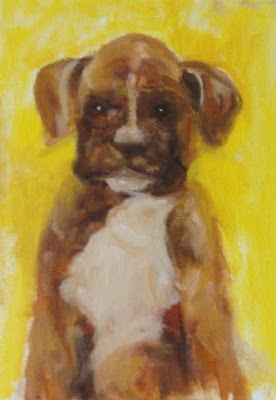 In the meantime my studies of the little boxer pup has been entertaining my family. It is quite comical at this stage. Looking forward to another day of painting tomorrow. Inspired by my friend Vic Errington. I wanted to do some pet portraits. 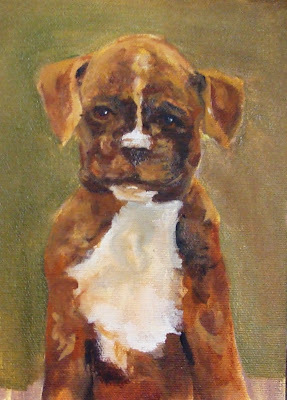 This is only a gesture of a boxer pup. I have been called to baby sit today. So I will work on this tomorrow. As I write the distortions are so clear to me, but it will have to wait. Also I thank Bruce Sherman, he in the process of doing a 4 panel painting of the seasons. He is a wonderful artist. Once again Mother Nature blasted Long Island with a major snow storm. 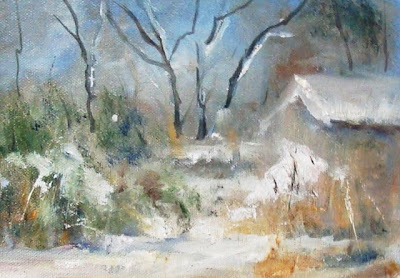 I do love snow, looking forward to going outdoors to paint this beautiful stuff. I did this study from my dining room window. Much rather be outdoors. Maybe tomorrow. Happy painting everyone. Worked on this one today. Still needs some tweaking. I will continue to other studies of this location. We are getting more snow this weekend. Not a blizzard, just 2 to 5. 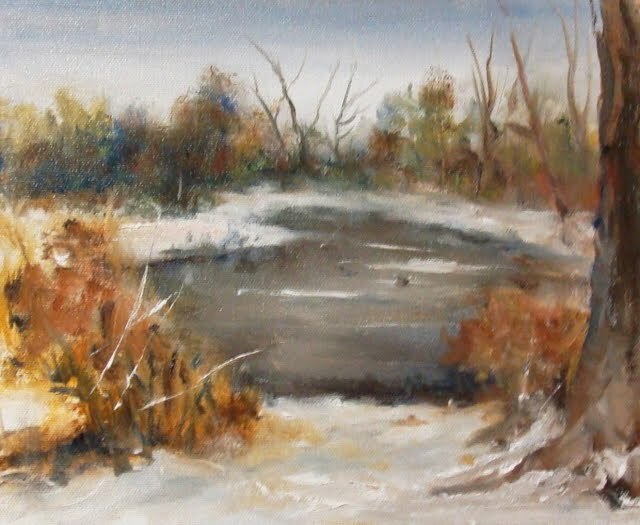 I would love to venture out and paint on location. Well anyway. Have a great weekend everyone. 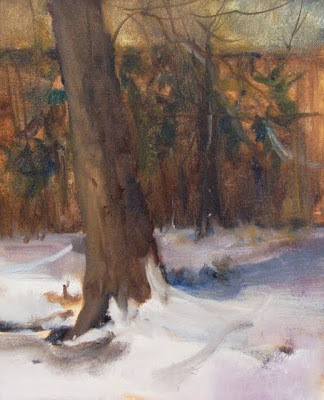 11x14 oil. This is the first step in my painting of Gull Haven. Even though a simple composition it is extremely difficult. I have to capture the texture of the snow and of course add the yellow flag and geese. It actually is a beautiful spot. I took a digital photo last week. Happy New Year everyone. Having a slow start to the New Year. 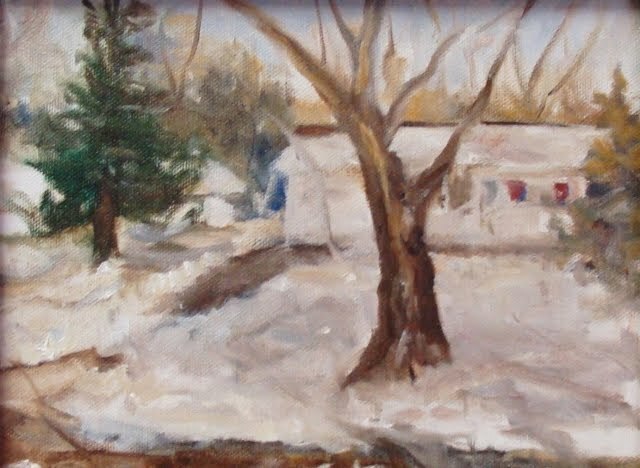 Did this 8x10 sketch of the snow fall we had before Christmas, I mean the blizzard we had 15inches of snow. Yesterday, my computer didn't work. So it was off to Staples, thank goodness it wasn't anything serious. No virus. Hopefully tomorrow I will get back to some oil painting. I have been enjoying everyone's post .